Many people want to make their own Lager beer, so often ask: What is the difference between Lager and Ale in brewing? Ale is upper fermenting beer, yeast moves to top liquid surface during fermentation. 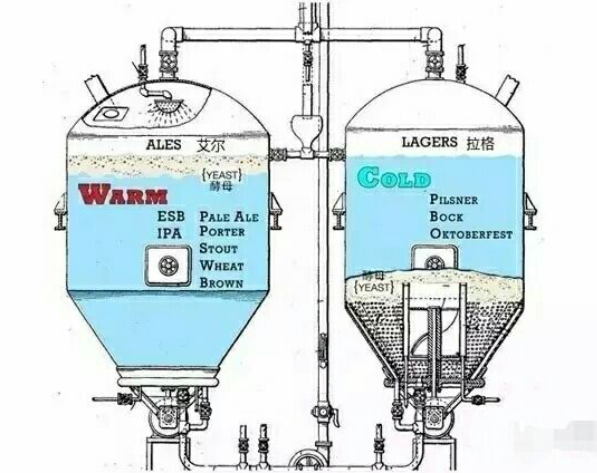 Lager is bottom yeast fermentation process. This is well known, and it is known that the fermentation temperature of Lager is relatively low. In general, the fermentation time of Lager is longer than that of Ale. Due to the relatively low fermentation temperature, which affects the activity of the yeast, the overall fermentation time is much longer than Ale. Ale generally takes 3-7 days for primary fermentation, and Lager often takes 1-2 weeks or even longer. Fourth, the amount of yeast. As mentioned earlier, the low activity of yeast due to low temperature leads to incomplete fermentation of the beer. The simpler way is to increase the amount of yeast delivered or to expand. For example, we usually make a pack of 10 grams of yeast when we brew a 12P Ale, then we recommend two packs when brew Lager. Fifth, the reduction of diacetyl. Diacetyl is a by-product produced by yeast metabolism in the early stages of fermentation. It has a substance with a creamy smell, which is unacceptable in Lager beer. (Some English Ale allows for a certain diacetyl odor and is a style feature). This kind of substance can only be reduced by yeast in the late stage of fermentation. The commonly used method is to increase the activity of yeast in the temperature, thereby accelerating the reduction of diacetyl. The temperature is generally 15-18. It is not recommended to be higher. If you are not eager to drink, 15 degrees is a good temperature. The recommended time is 2-5 days. It should also be mentioned that Lager beer tends to release a sulphur odor during fermentation. Generally, these flavors will slowly disappear with the ripening. The above opinion is only for reference, without authority.